Godchick Designs: Oh Happy Day!!! Lookie, lookie! Look what arrived!!! Oh, the glorious bling! 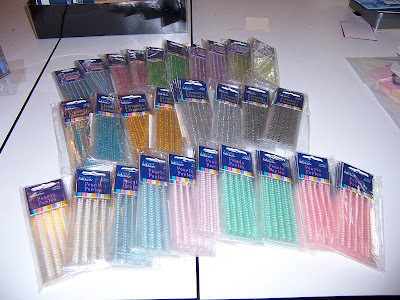 Here's a quick pic I took of all the rhinestones and all the pearls I ordered. Something I noticed...for some reason the 'natural' pearl color only has four strips of stones while the others have five. If I would have known this before I would have posted that info right away. The sales rep had no answer for either. Please accept my apologies for this. OH YEA !!!!! We have bling! oh my goodness gracious! PLEASE PLEASE PLEASE tell me if you do a share like this again! Or if have anyone who backs out - I would *love* to get some of these! I love those pearls and such!